Zand Parsa, A., Ashoori, S., Abdollahi, A. (2012). The Effect of Two Different Doses of Atorvastatin on Lipoprotein-A on Patients with Acute Coronary Syndrome. Iranian Journal of Pathology, 7(2), 101-106. Amirfarhang Zand Parsa; Sara Ashoori; Alireza Abdollahi. "The Effect of Two Different Doses of Atorvastatin on Lipoprotein-A on Patients with Acute Coronary Syndrome". 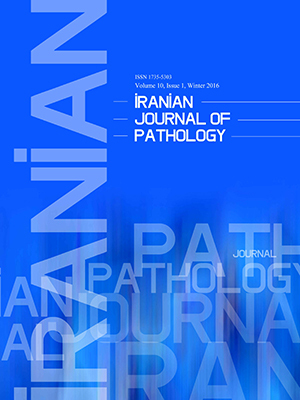 Iranian Journal of Pathology, 7, 2, 2012, 101-106. Zand Parsa, A., Ashoori, S., Abdollahi, A. (2012). 'The Effect of Two Different Doses of Atorvastatin on Lipoprotein-A on Patients with Acute Coronary Syndrome', Iranian Journal of Pathology, 7(2), pp. 101-106. Zand Parsa, A., Ashoori, S., Abdollahi, A. The Effect of Two Different Doses of Atorvastatin on Lipoprotein-A on Patients with Acute Coronary Syndrome. Iranian Journal of Pathology, 2012; 7(2): 101-106. Background and Objectives: Lipoprotein-a potentially represents a useful tool for risk stratification in cardiovascular accidents. The aim of this study was to evaluate the atorvastatin effect on serum lipid profile & lipoprotein A. Material & Methods: In 2009, 405 patients with acute coronary syndrome randomly were divided into 2 groups, taking 20 & 40 mg atorvastatin daily for 3 months. Lipid profile & lipoprotein-A serum levels were checked at the beginning of the study and also one and three months later. Results: There was no statistical difference between the two groups in all measurements except in patients with unstable angina. The difference lay in the change of LP-a level after one month (P=0.045) and in apo-A level in all patients in the second and the third measurements compared with the first one (P=0.001 & P=0.002). Discussion: It appears that the two doses (20mg and 40mg) of atorvastatin have a reduction effect on lipoprotein-A and serum lipid levels, but no difference is seen in the level of reduction. The 40 mg atorvastatin leaves more effects on reduction of apo-A than on the 20 mg after one and three months. Anuurad E, Boffa MB, Koschinsky ML, Berglund L. Lipoprotein(a): a unique risk factor for cardiovascular disease. Clin Lab Med 2006;26(4):751-72. Gudnason V. Lipoprotein(a): a causal independent risk factor for coronary heart disease? Curr Opin Cardiol 2009;24(5):490-5. Tziomalos K, Athyros VG, Wierzbicki AS, Mikhailidis DP. Lipoprotein a: where are we now? Curr Opin Cardiol 2009;24(4):351-7. Poli A. Atorvastatin: pharmacological characteristics and lipid-lowering effects. Drugs 2007;67 Suppl 1:3-15.:3-15. Executive Summary of The Third Report of The National Cholesterol Education Program (NCEP) Expert Panel on Detection, Evaluation, And Treatment of High Blood Cholesterol In Adults (Adult Treatment Panel III). JAMA 2001 May 16;285(19):2486-97. Goudevenos JA, Bairaktari ET, Chatzidimou KG, Milionis HJ, Mikhailidis DP, Elisaf MS. The effect of atorvastatin on serum lipids, lipoprotein(a) and plasma fibrinogen levels in primary dyslipidaemia--a pilot study involving serial sampling. Curr Med Res Opin 2001;16(4):269-75. Gonbert S, Malinsky S, Sposito AC, Laouenan H, Doucet C, Chapman MJ, et al. Atorvastatin lowers lipoprotein(a) but not apolipoprotein(a) fragment levels in hypercholesterolemic subjects at high cardiovascular risk. Atherosclerosis 2002;164(2):305-11. Branchi A, Rovellini A, Fiorenza AM, Sommariva D. Effects of bezafibrate and of 2 HMG-CoA reductase inhibitors on lipoprotein (a) level in hypercholesterolemic patients. Int J Clin Pharmacol Ther 1995;33(6):345-50.
van WS, Smilde TJ, Trip MD, de BT, Kastelein JJ, Stalenhoef AF. Long term statin treatment reduces lipoprotein(a) concentrations in heterozygous familial hypercholesterolaemia. Heart 2003;89(8):893-6. Wu SC, Shiang JC, Lin SL, Wu TL, Huang WC, Chiou KR, et al. Efficacy and safety of statins in hypercholesterolemia with emphasis on lipoproteins. Heart Vessels 2005;20(5):217-23. Christensen S, Thomsen RW, Johansen MB, Pedersen L, Jensen R, Larsen KM, et al. Preadmission statin use and one-year mortality among patients in intensive care - a cohort study. Crit Care 2010;14(2):R29. Wang PS, Solomon DH, Mogun H, Avorn J. HMG-CoA reductase inhibitors and the risk of hip fractures in elderly patients. JAMA 2000 Jun 28;283(24):3211-6.